"After a few years of friends encouraging me to write about my times in this business of showing off, I decided to give it a go. I’ve started from the humble beginnings of emigrating to the UK, in the hope that you get a grasp of the culture shock of change that I have experienced. For the better of course. I like to think that I have grasped the “Brummie” sense of humour along the way. Oroight?" ELO Beatles Forever [ELOBF] recommends "Aren't You Glad That Its Not Christmas Everyday? 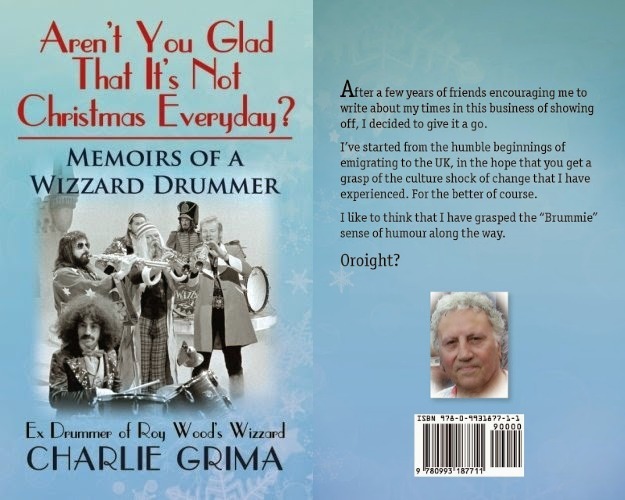 Memoirs of a Wizzard Drummer" by Charlie Grima to those enlightened folks who enjoy the music of ELO, Jeff Lynne, Roy Wood, The Move, Wizzard, The Idle Race, 'Brum Beat', The Beatles and related artistes.